Oil prices are beating the S&P 500 by a factor of four-to-one in the last year. Political tension between Saudi Arabia and the rest of the world over the disappearance of journalist Jamal Khashoggi could spur a spike in oil prices, if sanctions start flying back and forth. That's the narrative causing investors anxiety this week. There are a lot of unknown variables at play with that thesis - but there's an even more straightforward scenario that leads to triple-digit oil prices in the near term. While most investors have been fixated on the choppy rally in the S&P 500, energy prices have been experiencing another (even bigger) rally of their own. Simply put, oil prices are stomping the stock market, outperforming the S&P 500 by a factor of four over the last year. Simply put, oil prices look like they have a lot more room to run higher in the months ahead - and investors should take note. For retail investors, the easiest way to get exposure to oil prices is through the U.S. Oil Fund (USO - Get Report) , an exchange-traded fund that tracks the price of WTI crude oil futures on the NYMEX. 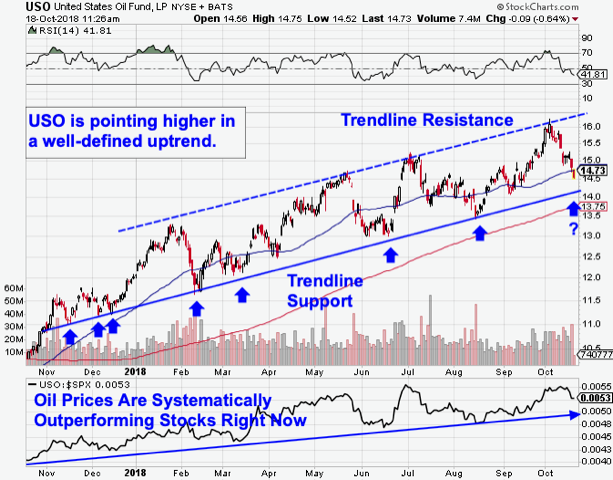 You don't need to be a trading expert to spot the over-arching trend in oil right now: USO has been pushing up and to the right in an extremely well-defined uptrend over the course of the last year. More specifically, USO has been bouncing its way higher in an uptrending channel, a price range that marks that high-probability trading range for this fund to remain within. So far, every test of trendline support on the way up has provided oil buyers with a low-risk, high-reward opportunity to double-down on their positions. And the correction in oil prices that began in October puts USO on track for another buyable bounce later this month. Relative strength, the side indicator down at the bottom of the USO chart, adds some extra confirmation to the bullish bent to USO. Relative strength has been in an uptrend of its own, indicating that oil prices are systematically outperforming the stock market even now. Simply put, the next bounce off of support, currently around the $14 level in USO, is the buy signal to be on the lookout for. At this point, oil prices have a little more room to correct before they reach the bottom of their trend channel - but, if prior support tests are any indication, investors should expect a swift rebound rally once that support test happens.